I think subscription boxes are a fabulous idea—and when I say subscription box, I’m really only considering those with books. Each month, you receive a box with a new book to read and a handful of goodies. Pretty neat, right? I haven’t actually subscribed to any of these boxes, because I much prefer reading things on my kindle. Also, I only have enough time to read about a book a month and want to pick the books I read, and although I would love a mountain of nice, new hardcover books, I absolutely don’t have the shelf space. I’ve also been burned by a ton of subscription services in the past, including the local newspaper1. However, there are tons of avid readers who collect beautiful books and revel in bookish goodies. I love watching videos of people opening their new box and fawning over all the items inside. When a fellow indie author announced that their debut novel would be featured in a particular box, I realized I could potentially get my novels in a box as well. It would be an excellent opportunity to get one of my books in front of new readers. The company organizing the box would have to buy a bunch of copies of my novel—already making it a sweet deal for me—and their customers might like my book from their box enough to purchase my other books. I had to look into this avenue both for the exposure and profit. 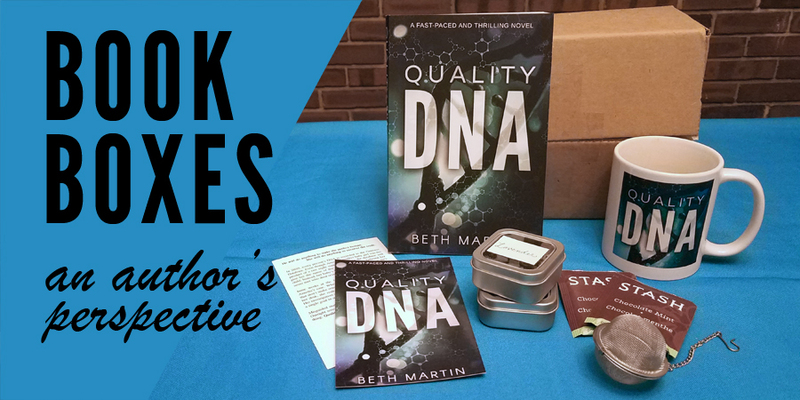 I sent review copies of Quality DNA to two different box curators and was accepted for both. Then both of them fell through. With all the stumbling blocks I’ve navigated in my indie author career, I’ve always done my best to keep my head held high, and this is no exception. Since the whole book box idea is still really appealing, I decided to give the model a closer look. On a writing forum, another author mentioned that they started their own book box and marketed the subscription box, so when their debut book came out, they had all the logistics of creating curated boxes full of goodies down and were able to produce a special pre-order box for their book, which sold really well. I’m already stretched pretty thin and can’t imagine setting up my own subscription service, although I did find the idea tempting. However, I could certainly put together a one-off box. Several authors have offered pre-order swag. After pre-ordering the book, a reader can email the author a picture of your receipt and shipping address, and the author will send a package of goodies. For physical books, pre-orders count as release-day sales, and launching to a large number of sales increases both the book’s rank on online retailers and the odds of making national best-seller lists. It’s a pretty smart business move and I can see why authors take advantage of it. Since I use Createspace to print my books, I can’t set up a pre-order. I could do something similar for ebook preorders, but since the royalties made per book aren’t super high, even the postage to mail an envelope would make a big cut into my profits. Also, ebook preorders don’t help a book’s rank on release day, so there’s no real reason to promote them. Other marketing activities have already eaten up most of my launch budget, and I’d prefer not to lose a ton of money on book launches, so an ebook pre-order incentive is out. If I wanted to do a book box, I’d have to wait until the book is actually out so I could order copies, sign them, tuck them into pretty boxes with other cool items, and ship them to fans. I would have to charge extra to cover all the shipping costs and additional items, and hand-selling copies instead of directing readers to Amazon actually hurts the book’s rank. Basically, I’ve looped back around to, “Well, I should try to submit my book to an existing subscription service,” which is definitely something I will still pursue. But I haven’t given up on creating a cool new promotion idea for my upcoming novel, In the Lurch. 1. Funny story, after they considerately renewed my daily paper subscription for 6 months, the paper sent me a bill along with a threat to send my account to collections. I had only received 2 papers. Customer service told me one of my neighbors must have stolen it… every day… for nine months. Apparently, I was supposed to call the carrier every time my paper didn’t arrive. Only after pointing out that I had no way of getting my carrier’s phone number (and customer service certainly didn’t have it), and I had never consented to any sort of renewal, was I told that I should send a snail mail letter to billing so they could maybe waive the new bill.